Thanks to the ‘Humanitarian corridors’ program which Oxfam is part of, the Al Jarrah family now lives safely in Italy. Syria will always be their home, but here they have found a new hope for their future. Although world leaders have been quick to condemn attacks on Syrian civilians, many of those same nations have maintained a discriminatory and dangerous policy of keeping out Syrian refugees. Yet, things can be done in a different, more human way. Oxfam is part of a program called ‘Humanitarian corridors’ that helped 1000 Syrians find refuge in Europe without having to risk their lives in perilous sea crossings or long and dangerous journeys over land. And it is making a real difference. 18 months ago, Mohammed and his brother Mouhib were living in the Bekaa Valley in Lebanon in poor conditions - 8 people sharing a damp garage. They were also exploited as unskilled labor on a low wage that was not always paid. Mohammed, Mouhib and their mother Malak. 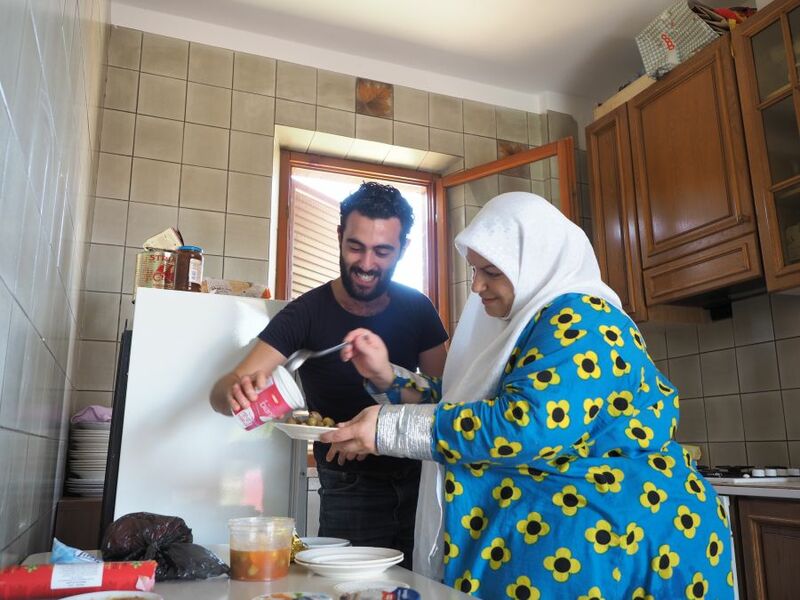 Before she could make the difficult journey to Lebanon, Malak spent years in Damascus, moving from one house to another, a guest of relatives or friends. In 2011, the brothers had fled with their mother, Malak, from the rural Damascus suburb where they had grown up - carrying nothing except the documents and the clothes they wore. Still at the beginning of the Syrian crisis, they presumed they would spend a few months in the city itself until the clashes ended and would return home. After several meetings, Mohammed, Mouhib and Safa were finally given permission to leave Lebanon with their mother, Malak, without facing a perilous trip across the central Mediterranean route - which has already seen more than 350 deaths this year. Mouhib helps his mother prepare lunch. Oxfam is hosting and supporting them with healthcare, legal assistance, Italian language classes and the process of integration and starting a new life. Arriving in Italy, the Al Jarrah family received a warm Tuscan welcome. Here Oxfam is hosting and supporting them for the duration of their asylum process with healthcare, legal assistance, Italian language classes and the process of integration and starting a new life. 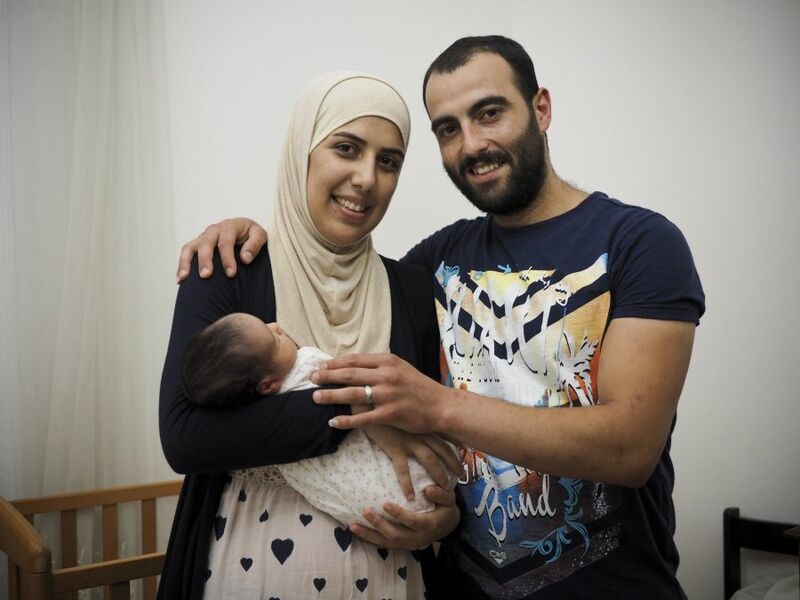 Mohammed, Safa and their new born daughter Rivan. “What I dream about for my daughter's future is that she can one day know Syria, meet her relatives and see our homeland.” says Mohammed. Over 7 years since the beginning of the crisis in Syria, less than three percent of the Syrian refugee population have been resettled in rich countries. Thousands of them are still stuck in Lebanon and elsewhere. You can help them have a better life by supporting our work. And give them another future.